The Place to Be for anything Hyundai Coupe related! Visit the Club FORUM for all your Hyundai Coupe needs! Then one day the forum was closed. A group of Coupe owners decided to start their own forum and HCOC was born. This was still a few years back! Since then HCOC has gone from strength to strength. The shop, for all HCOC merchandise, is in the process of being revamped and we are reviewing our different member options! So if you fancy your own say, pop along and make a suggestion on the forum. But of course HCOC is not just about selling cars or the forum. HCOC is about the community spirit and its members, we operate a very active social network UK wide and value all input from our members. HCOC operates UK wide and our members have regular meets where we chat about our cars, or anything that takes our fancy, while enjoying a meal in a restaurant or just meeting up in a carpark overlooking the Brecon Beacons in South Wales. 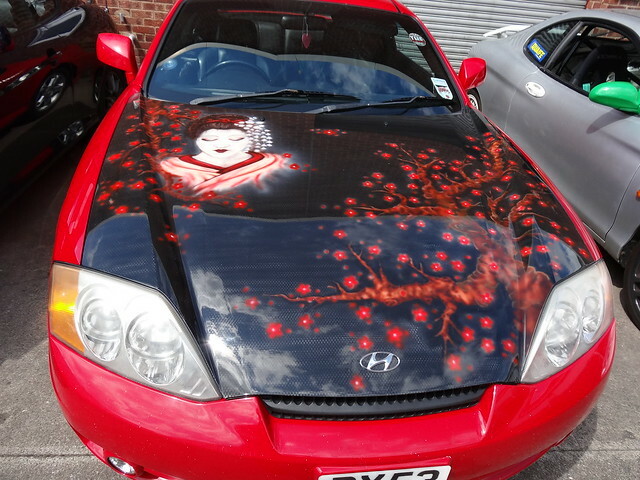 HCCS Ltd is a car sales company focused on selling good quality used Hyundai Coupes, we set up HCCS due to the huge amount of cowboys and "back lane dealers" out there, with HCCS you can be sure your Hyundai Coupe has been thoroughly checked over and any faults rectified by our OCD technicians. Of course the Forum is the heart of our community, but where would any community be without a Social Networking presence? We at HCOC have a dedicated Social Networking team and operate custom pages in all of the major Social Network sites - Links at the bottom of this page. A cool video we were made aware of that takes a Hyundai Coupe and remakes the Knight Rider intro. This meet banner shows various meets from the past, why not join us at the next meet in your local area? Check out when it is on the Forum. Our resident Air Brushing Artist, Bex, shows off her artwork. This is what is all about! Meeting up with your mates, a BBQ (off camera) and loads of cars to drool over. Ready to do YOUR PART for the community? Why not sign up to the forum? Or Donate to the upkeep of the forum to keep us running? All donations go into the forum and social events and NOT into HCCS Ltd.